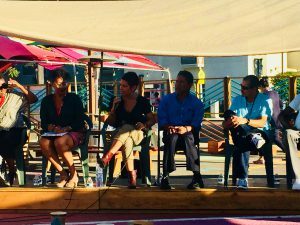 Keijuan was the youngest speaker on a recent panel discussion about restorative justice at the Dojo Café in City Heights. The 15 year old is also a beneficiary of efforts that have led to the expansion of such programs. A year-and-a-half-ago, he found himself in trouble, but instead of facing law enforcement, he was offered a chance to make things right for all those affected. Now Keijuan is showing the world how restorative justice programs can help youth stay out of prison. He’s also playing baseball, a skill he learned when he was three years old. Helping young people like Keijuan is one of the reasons several leaders met at the Dojo Café, which also serves as a community meeting space in City Heights. Several community leaders gathered together to look for ways to get more people involved on restorative justice efforts to help youth in the region stay out of prison. The meeting was organized by members of Mid-City CAN’s Peace Promotion Momentum Team, which supports restorative justice as an alternative to address delinquent behavior by involving the youth responsible for the crime, the victim, and the community. “Everyone say ‘word’,” Tayari Shorter, one of the cofounders of the Dojo Café, said as he welcomed everyone who came out for the conversation. He also shared how he got involved with restorative justice work, recalling one day when he was working at the Dojo Café and someone ran off with his tip jar. It was in October of last year after the coffee shop had just opened. “I saw the look on his face, I saw myself in his youth, together we walked back into the Dojo, I told him of the work we are doing, and that he was the type of person we are here for,” Shorter said. Shorter is new to restorative work, but he recognizes the need. This week, the Sacramento Bee reported a new study concluded that California students still experience wide disparities in the number of days different racial and ethnic groups are suspended. The study found 11 percent of Latino students are suspended for 25 days or more. Disparities for many groups have improved, including Latino students, but there is still more to be done. Five years ago, Felicia Singleton, who was also on the panel, told the crowd she was challenged to reduce suspensions and expulsions, a task she thought would be easy, but soon saw problems. Singleton said the traditional school system doesn’t allow space for conversations. “So my pitch was how do we want our students to come back to us? Do we want them to come back the same way that they left? No because then they will do it again. And we’re becoming the vehicle that’s shoving them down the school to prison pipeline,” Singleton said. Last year the San Diego Union Tribune (SDUT) reported that juvenile crime rates were down as a result of new approaches to address crimes by young people. The SDUT also reported data compiled by the San Diego Association of Governments (SANDAG) showed the juvenile arrest rate in the county went down 53 percent from 2011 to 2015. On the panel was also Sean Elo, director of campaigns and policy with Mid-City CAN, who began speaking by saying the justice system was operating as it was designed to operate. He also said a bill on Governor Jerry Brown’s desk right now would stop students in kindergarten through third grade from getting suspended over willful defiance, which means to disobey. Elo also wants to see legislative budgets include funding for training for police officers who participate in restorative justice programs. Organizers of the panel discussion said the meeting is the first of more to come in the coming weeks. Elo ended his comments with a call to action referencing Mid-City CAN’s Peace Promotion Momentum Team, who meet once a month to talk about creating a better system. He told the crowd, everyone has the opportunity to join.